R-Drive Image is a potent utility providing disk image files creation for backup or duplication purposes. R-Drive Image 4.7 is a potent utility providing disk image files creation for backup or duplication purposes. A disk image file contains the exact, byte-by-byte copy of a hard drive, partition or logical disk and can be created with various compression levels on the fly without stopping Windows OS and therefore without interrupting your business. These drive image files can then be stored in a variety of places, including various removable media such as CD-R(W)/DVD, Iomega Zip or Jazz disks, etc. R-Drive Image restores the images on the original disks, on any other partitions or even on a hard drive's free space on the fly. To restore system and other locked partitions R-Drive Image is switched to the pseudo-graphic mode directly from Windows or bootable version created by the utility is launched from CD disc or diskettes. A free 15-day trial version allows you to verify all R-Drive Image capabilities. R-Drive Image trial version installed on Windows OS is fully functional. R-Drive Image trial bootable version launched from startup disks (either 2 floppy disks or a CD) is fully functional but its functionality can be tested on the same PC where R-Drive Image trial Windows version is installed ONLY. Smart data imaging support for more file systems. In addition to FAT and NTFS, R-Drive Image now can backup only useful information for exFAT, HFS/HFS+, Little and Big Endian variants of UFS1/UFS2 and Ext2/Ext3/Ext4 FS (Linux) file systems to reduce image file size. Smart bad sector processing. R-Drive Image can now handle bad sectors encountered on the disk. Smart processing of corrupted image files. R-Drive Image can now restore data from a valid part of a corrupted image file. Backup sets. A backup set is a set of files (usually a file for a full image of an object and a number of its incremental/differential backups) which R-Drive Image treats as one unit. Backup sets are used to flexibly control the parameters of complex backup tasks such as a total size allocated for the image files, number of image files to keep, and time for which the data will be kept. Windows Vista and 64 bit processors support. New R-Drive Image version supports all Windows Vista operating systems and 64 bit processors. Acceleration of image creation and disc copy operations. Asynchronous I/O and distributed the zlib compression library were added among different processors. As a result, users can see up to 200% speed gains in image creation and disc copy operations. Differential image creation. When the incremental/differential backup is being created, the differential image can be created by comparing the current data with the 128-bit hash of the original data without reading the main image. That speeds up the process of creating the incremental/differential image in any case, but also no need to change the original discs when writing the image to CD/DVD discs. Incremental image creation mode. In the previous versions the differential mode was available only. A bootable module can be written to a CD/DVD disc together with the image data. Thus it is possible to create one CD/DVD disc to boot and to restore the system. Microsoft Volume Shadow Copy Service (VSS) support. In order to create a point-in-time snapshot of a database, the servers like Microsoft Exchange, Microsoft SQL and Oracle are notified before backup process begins. The technology allows synchronizing the servers' database and creating the correct copies of quick-changeable data. Dynamic Disks and BSD slices support. Dynamic disks and BSD slices can be backup, restored and copied. 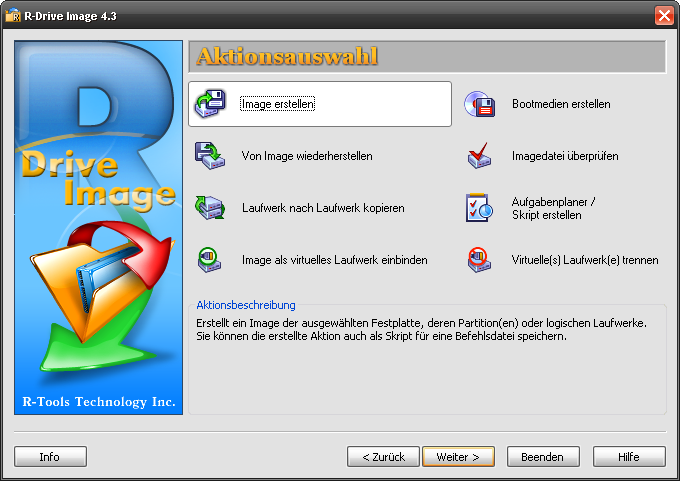 The feature is supported in both Windows and bootable versions of R-Drive image. You may create an image of one disk or a volume of any type and then restore the image back to a dynamic or basic disk. However when such image is restored you may not change a size or other characteristics of the target disk. When you restore a dynamic disk image to a basic disk, the basic disk remains basic and is not converted to the dynamic disk. A flexible control over CD/DVD writing. That allows limiting the writing speed and caching in the ISO file. Improved file format of the image created by the application. Writing to NTFS partitions. Now the R-Drive Image bootable version (based on the Linux kernel) supports writing to NTFS partitions as well as R-Drive Image Windows version. A simple wizard interface - no in-depth computer management skills are required. Network support. R-Drive Image bootable CD version supports disk image file creation and restoration over Microsoft network (CIFS protocol). Pseudo-graphic mode. Restart to the pseudo-graphic mode directly from Windows to restore data to the system and other locked partitions. No need to use startup disks any more. USB 2.0 devices support in the pseudo-graphic mode. With hard drives prices constantly going down, an external IDE-USB 2.0 HDD case with an appropriate hard drive is an ideal (fast and reliable) solution for notebooks and sealed PCs to backup system and other partitions that can be restored only in the pseudo-graphic mode. Do not use numerous unreliable CD discs and slow CD/DVD recorders any more. Remember: with the incremental backup, this hard drive is not to be too large. Bootable version. Special bootable disks (either 2 floppy disks or one CD) can be created to restore data to the system partition. Individual files and folders restoration. A disk image can be connected as a read-only virtual drive and its content can be viewed and copied. File system conversion. The file system of the restored disk can be converted to another one (FAT16 to FAT32 and vise versa.). Partition replacement. Data from a disk image can be restored on other existing partitions. R-Drive Image deletes such partitions and restores data on that free space. Scheduler. A time for disk image creation may be scheduled and the process can be run in unattended mode.